Monday 19th January …. 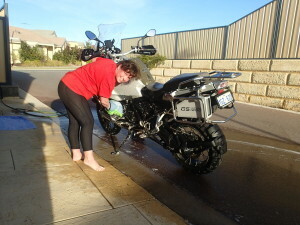 This is the way we wash the bike, wash the bike,wash the bike, this is the way we wash the bike so early in the evening! Customs requires the bike to be spotless, both inside and out, so Karen and Vince took to it with toothbrushes – literally! We don’t want anything holding this baby’s travels up at either leaving Australia or arriving in the UK. Good as brand spanking new!